My wife is studying for her masters at the University in Sakhon. This small hotel is perfect for us.10 min drive to University. We loved the private cottages. They were very private and convenient. We can park our truck just outside the cottage and carry our things inside. The room was immaculately cleaned. We have decided to use this hotel on a weekly basis since my wife’s classes are only on weekend and we travel from Nakhon Sakhon. Thank you Colorville for providing such a nice place for a very fair price for a family budget. 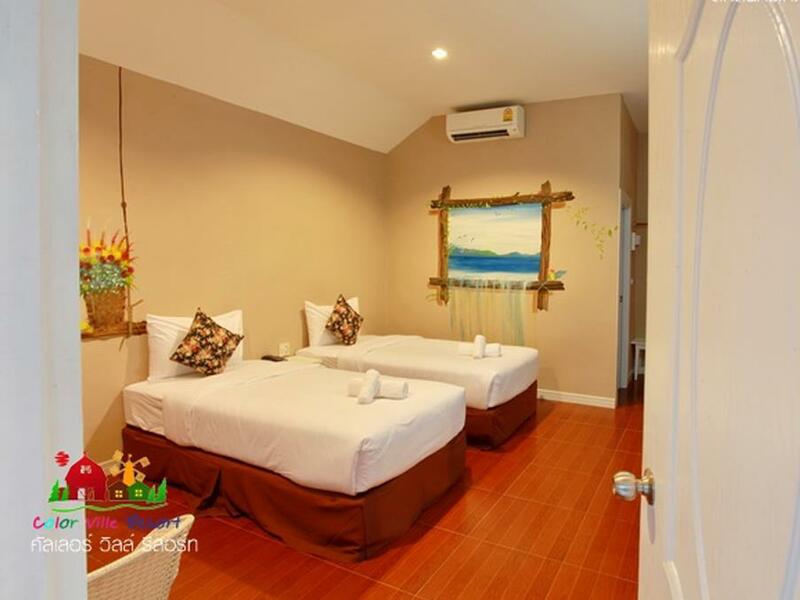 The room is spacious with big shower room .Nice decoration its make resort look very lovely. Quiet area but not far from bus station. Nice and Clean, The front staff is very friendly and give free upgrade, it would be better if provide safety box in room. The resort is colorful and lovely. Nice and colorful design. 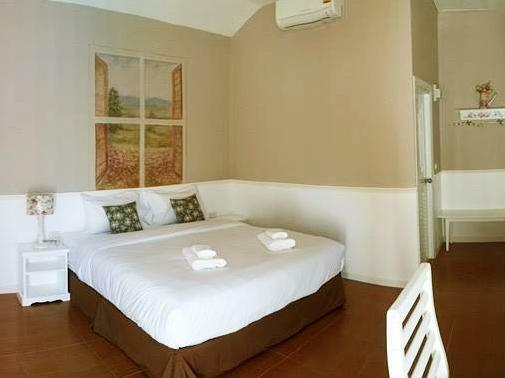 Big room and clean facilities. Attentive staff. I will choose this hotel again next time. We were surprised that the room was clean and nicer than we thought. Need a car to travel around. They have a restaurant there but we did not try. very worth the money. Cute and warm design. The Color Ville Resort is actually more of a motor inn than a typical resort. Even so, it was a wonderful place for my wife, daughter, and I to stay. Each room is its own building, built in the style of a barn. There was always one staff person present who spoke English whenever we needed to talk. The staff were very friendly and accommodating to any special request we had. Breakfast is “Thai simple” with toast & jam, cookies, and instant 3-in-One coffee. This is normal for Thai motor inns, but less than at a typical resort. The building where breakfast is served is exceptionally cute, looking like an old farm house with seating inside, on the wrap around patio, and on the rooftop. After breakfast hours, the farm house is open as a coffee & desert shop. We were always on the go during the day, so we did not get to sample any of these products, but they all looked delicious. Parking at Color Ville is sufficient, with individual parking places for those renting the larger barns, and additional parking for those in the smaller barns. Our bed was typical Thai-hard, but after five years in Thailand, we're very used to this. It is the standard for Thai lodging services. The bed in the big barn is king size with good pillows. There is ample room for an extra bed and all our stuff. The bathroom was adequate for our needs. The hotel is located less than 1 KM from the highway, on a well traveled and newly built side road. There are traditional Thai restaurants along this side road and numerous Thai and western restaurants throughout Sakon Nakhon, all within 10 KM of the hotel. There are no sidewalks along the road, so use caution when walking. I was disappointed to find that Color Ville does not offer bicycles for customer use, something I expect to find at a Thai resort. All in all, I found staying at The Color Ville to be quite pleasurable and very affordable. I highly recommend it for anyone visiting Sakon Nakhon with their own personal transportation. Enjoyable stay, the design sets it apart from other accommodation, I like a bit of individuality in accommodation. Everything was new clean and in good order. Nice place to stay. I was a bit reluctant at first due to very few reviews. However, the place turned out perfect. The only downside is that it is a bit far from the town itself but we had a rental car so that was no issue. Staff was very helpful in giving tips about places to eat, etc. Dans l'absolu c'est pas mal, ça a du charme, c'est bon marché, la chambre est grande. Dommage qu'il y a des travaux en ce moment juste derrière (bien qu'à l'heure où ça commence, vous devriez déjà être levé), après ce n'est pas la faute de l'hôtel donc pas vraiment en reproche. ça reste un choix intéressant par rapport au prix mais il faut être véhiculé car c'est hors centre ville.